Philips Viva Airfryer HD9220 is a healthy fryer that allows you eat crispy but healthy food. Designed to take very little space on your counter, this deep fryer will steal your heart. Honestly, who can refuse French fries or a crispy chicken wing? If you own a deep fryer, you know how much oil you need to fry food. We can all agree that using a lot of oil is not only unhealthy, but also expensive. With Philips Viva Airfryer you can still enjoy your favorite fried food. Keep on reading to find out how. The fan and the heating element of Philips Viva Airfryer HD9220 are located at the very top of the unit. Also, the cooking basket is located in the bottom and it pulls out like a drawer. The metal mesh is actually the bottom of the basket. That allows air circulation, which is what makes the healthy chips and french fries so delicious. Simply, use the dial to adjust the temperature from 80 to 200 degrees. Also, you can set the cooking time up to 30 minutes. At last, Philips Viva Airfryer is quiet enough not to bother you. Learn here What Can You Cook In An Air Fryer? With Rapid Air Technology, Philips Viva Airfryer fries food with no oil. More precisely, most of the food preparation requires no oil, although some may need a sprinkle for better taste. Nonetheless, frying in Philips Viva Airfryer is undeniably heather than deep frying. Finally, you can enjoy anything from french fries, chicken wing, healthy chips, etc. Also, you could use it as a fan oven for baking and roasting, thanks to the Rapid Air Technology. Of course, cleaning is no problem because both drawer and the food basket are removable and dishwasher safe. Philips Viva Airfryer is very convenient when it comes to counter and storage space. This healthy fryer is thin in comparison to the rest of fryers on the market. Of course, it wouldn’t take up a lot of space on your kitchen counter. Needless to say, its modern design will make you keep it on display. If, after all, you decide to store it away, that’s no problem, thanks to its size. Another thing that makes storage easier is the cord that pulls in. Dimensions of Philips Viva Airfryer are as it follows: 12 x 13 x 15 inches. Also, its settings are fairly simple. 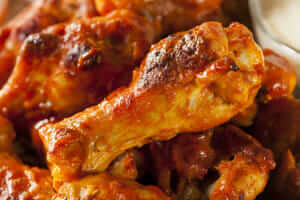 All you have to do is set the dial and timer knob to your preference and this chicken wing master will do the rest. 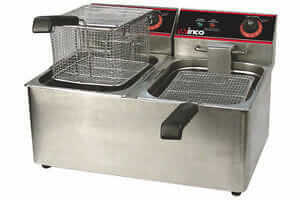 Since this fryer is rather small in dimensions, its capacity is no different. 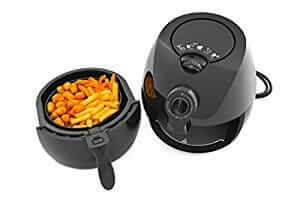 Philips Viva Airfryer can fry up to 800g of healthy chips. You’ll have your healthy chips crispy and ready in only 22 minutes at 180 degrees. Not only that, but you won’t need any more than 18ml of oil for those healthy fresh chips. With its 230V it does all frying, baking and roasting quickly. No doubt that you’re already convinced you need Philips Viva Airfryer in your kitchen. This small but powerful unit makes a chicken wing unlike any you tried before. Its 1425W allow you to have your chicken wing and french fries in a blink of an eye. Not only that, but you’ll be surprised with the superb taste the fryer delivers. Philips Viva Airfryer comes with very little accessories because, except of the fryer itself, you won’t need much more. This healthy fryer comes with a nonstick drawer, just like the Philips Viva Collection Digital airfryer. Also, the recipe book is included. The book has many different recipes so don’t be afraid to try all of them because you won’t be disappointed. Another useful thing included is the Owner’s Manual. In case of any questions, the manual has all the answers you might need. Of course, one of the most important things to look for is Warranty. In the case of Philips Viva Airfryer, there’s a 2 year guarantee when bought directly from Philips. When you buy on Amazon, you can use their customer service to request warranty from the manufacturer. Keep in mind that manufacturer’s warranty doesn’t apply in all cases. Mostly, it depends on various factors such as where you bought the kitchen product and who you bought it from. Most people who have tried this healthy fryer are impressed with its job on foods like chicken wing and healthy chips. Reviews online show that french fries and healthy chips made in Philips Viva Airfryer are the best you’ll ever try. Also, the reviews show that you’d fall in love with the taste it delivers, from chicken wing, french fries to prawn crackers. Finally, its ratings are impressive 4.7 out of 5 stars. Finally, much like Philips Viva Collection Digital Airfryer, Philips Viva Airfryer delivers extraordinary results. No doubt, this chicken wing and french fries champion has the ability to change your life. Frying with air instead of oil is an innovative and easy way to improve your diet and health. You’ll be able to reduce your calories and fat intake without giving up on the delicious taste of fried food. What if we tell you that a healthy diet is more than plain vegetables? Now, you can freely have that fried chicken wing, fries, and prawns. 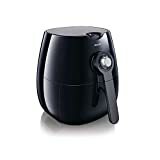 Alternatively, you can try ​De’Longhi Air Fryer, Avalon Bay AB-Air Fryer100, BIG BOSS 1300-Watt Oil-Less Fryer ! Do you have any experience in frying without oil? Have you ever tried a healthier version of french fries, or a chicken wing? 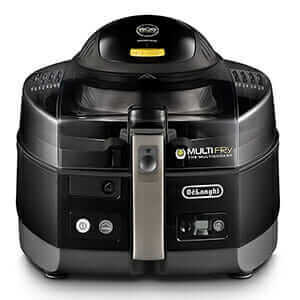 Check here our Best Air Fryers for home use. 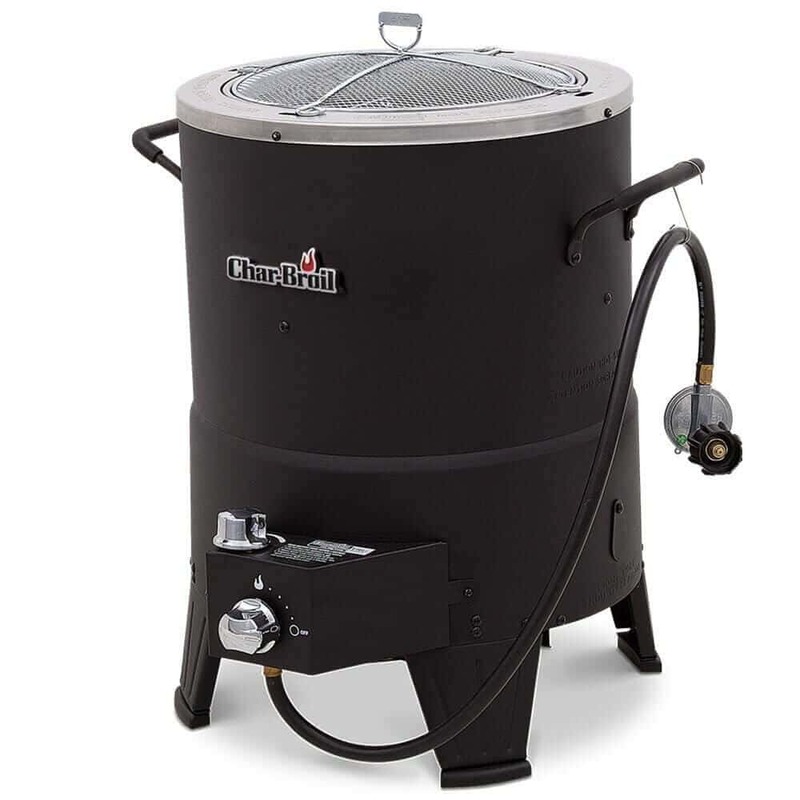 Do you think airfrying can replace standard deep frying? Please, feel free to express your opinion in the section bellow.